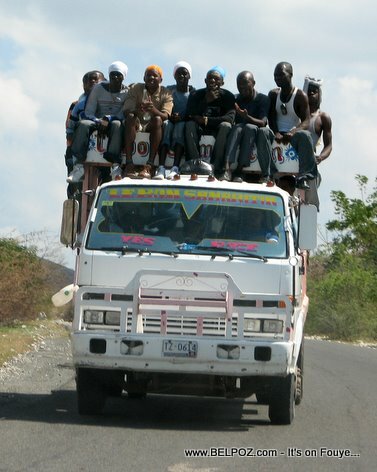 A deadly accident near Trou Forban, Montrouis Haiti Saturday caused the death of at least 11 Haitian citizens with at least 4 wounded after an overloaded truck carrying rice to Jean Rabel ran over a Tap Tap en route to Arcahaie. According to news reports, the big truck loaded with rice was attempting to pass a slow moving vehicle when he ran over the tap tap coming from Montrouis. Haiti's Interior Minister reported 15 dead and 14 wounded. New law no more humans allowed to seat on top of vehicle. Every one should be seated comfortably..
Yon aksidan machin nan zone Montrouis Haiti lakoz 11 moun mouri pou pi piti samdi ki sot pase a.
Yon kamyon chaje diri ki pwale Jan Rabel al eseye double yon lot machin, li monte sou yon ti kamyonet ki tap soti Montrouis pou ale Arcahaie.